Once the Grantham Canal is returned to full navigation, it’s hard to think of a better stopping off point, on the journey from the River Trent to Grantham, than the picturesque Nottinghamshire village of Hickling. With the pretty canal basin and many bridges along this stretch ALREADY restored, it’s easy to imagine what it will be like to moor up and watch the other boats go by, pint in hand, at the historic Plough Inn. 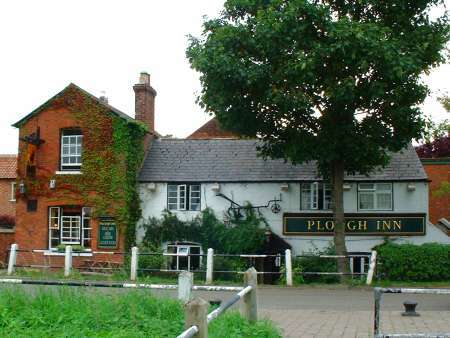 The Plough is the only remaining hostelry of four which once served the thirsty “navvies” passing through Hickling. “The Navigator”, “The Wheel” and the “Old Bowling Green” all closed down long ago but the Plough survives and is a quaint little pub which, especially after it’s recent refurbishment, any self-respecting drinker would go well out of their way to visit. Current landlord Chris Howard is rightly proud of his achievements in changing the look of the pub since taking over in March 1999, but without carrying out the interior demolition that’s so much the trend these days. “I want to keep the cosy, traditional character of the Plough, with separate rooms to suit different customers”, he says. “We’ve created a non-smoking area for diners (food is served lunchtime and evenings Monday and Wednesday to Saturday and also on Sunday lunchtimes). We’ve kept the snug for people who want to have a quiet drink on their own and the back bar’s now more suitable for the youngsters – with gaming machines and a juke box – whilst the bigger room up the stairs is a favourite place for locals to come for a chat or a game of darts.” In winter you’ll also appreciate the open fires, whilst real ale fans will be heartened by the row of traditional hand pumps along the bar. Chris is very enthusiastic about the restoration of the Grantham Canal – “It’s wonderful – long overdue! It can only bring more prosperity to Hickling. Already, lots of walkers, cyclists and fishermen come here, but it’ll be great when the boaters start to turn up. Maybe the warehouse could be converted to some kind of canal centre?” He adds that the upheaval of installing a turntable bridge to allow through navigation would be worth it to slow down the traffic which speeds through the village. Also there’s scope to extend the pub gardens to create canal-side moorings. There can be few more worthwhile things to drink to than that!